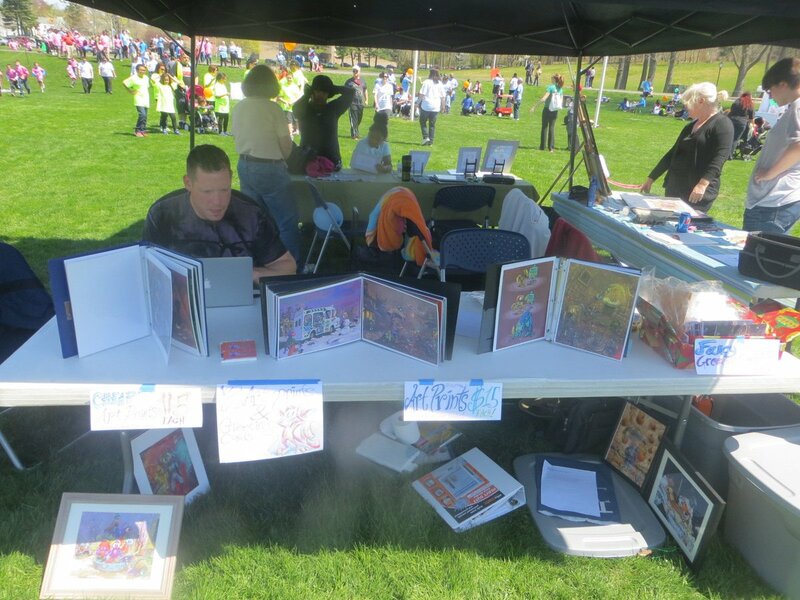 This Sunday once again, I will be selling art at the Connecticut Walk for Autism event. As in past years I am raising funds to provide autism to those in need. There is my table from last year plus my relation Big Ian Sea. in case you thought I would be tasteless without also meaning it. Also, until further notice, that is his theme music. OBVIOUSLY that person is not me; he is using a Mac-book! I may have autism but I am no fool. Incidootily I caught it from eating some undercooked salmon. That is the real reason I never order fish. And I tell you of this not because I am proud I am attending or because I expect you to attend: you could not possibly, on such short notice, from your location. In fact Ian has his own event this evening at some place or another, and that is what I made that “music” for, but I am so frazzled by all the backed up nonsense in my life that I only got it sounding like THAT just now and it was worse earlier, and consequently I can only justify its abrupt existence by showing it to you, bimshwel. I cannot show it to anyone else until it is much better than that, which it will have to wait in line for. Although increasingly I identify myself as bimshwel, which makes things confusing when I talk to you, bimshwel-the-website. I do not address myself by my name when I talk to myself; That makes me uncomfortable. And for a few years I have tried to dissuade myself from calling myself bimshwel due in part to the conflict with you, but I keep coming back to it. Maybe it is YOUR name that is wrong, bimshwel-the-websit. Blogroll | How to lose a guy in (3) days | ! A strange series of structures I drew two years ago. I thought this lacked a central focus and wanted to wait until I thought of one to show it, but, assuming that is always feasible, it is not always necessary! I added the bird thing and the two figures near the lower edge, anyhow. Between 2001 and 2006 I started a bunch of stories that I am still working through, but their settings all look so earthly or worse, domestic to me now. If I started another I would put it in a place like this. Although I fear I will attempt to relocate existing stories to this kind of place and make more trouble for myself than I require. Places without ground are more interesting to me. They are more fun to look at. NEMITZ, unsightly | How to lose a guy in (6) days | ! I suspect they err frequently. I have recently been clarifying visual aspects of some old frustrating project I started and never finished, so I could finally put it on the internet and purge it from my mind, and as usual I turned it into a far more complex matter than it needed to be. I enjoy the results, overall (don’t tell these idiots that), but they somewhat overwhelm what I initially intended to show and may therefore prove a waste of time. But that would then be consistent with what I was attaching them to. motional | How to lose a guy in (5) days | ! I feel bad erasing elpse’s face spots because they did work at first, but I quickly stopped drawing them, and over time the shape of elpse’s head changed and the spots did not fit as well. They were supposed to semi-circle from one point on the forehead bands to the other. I used to want to also change kumquat’s computers all into space-wasting mainframe things, but I suppose here the whole room is supposed to be one. Generally I think modern tiny computers are less visually stylish, and show even less invention on my own part to include them. And this comic strip in general, especially this part, is very domestic and mundane. The one thing I am glad I did, even though it only is seen much later, is showing the money as little balls of fuzz instead of coins or shiny objects. But maybe little trinkets as currency is even mundane. Maybe currency is mundane. Maybe hands and faces, maybe all chordate features are mundane. Maybe words and emotions and time are mundane! Honestly, you need to lighten up. But I ALSO don’t want to spend so very much time on stuff that I drew ten years ago. I would rather write new stories than alter old ones in superficial ways that take me forever for some reason. And that makes these write-ups less pleasant as well. What I can do, without making things harder, is remove thought baubles that do not accomplish anything. Sometimes it entertains me to have the characters say simple things in needlessly verbose ways, but sometimes it is just more words. Elpse initially thought “makes me mad” in the lower left frame. But elpse is obviously made mad! Many things cause this. 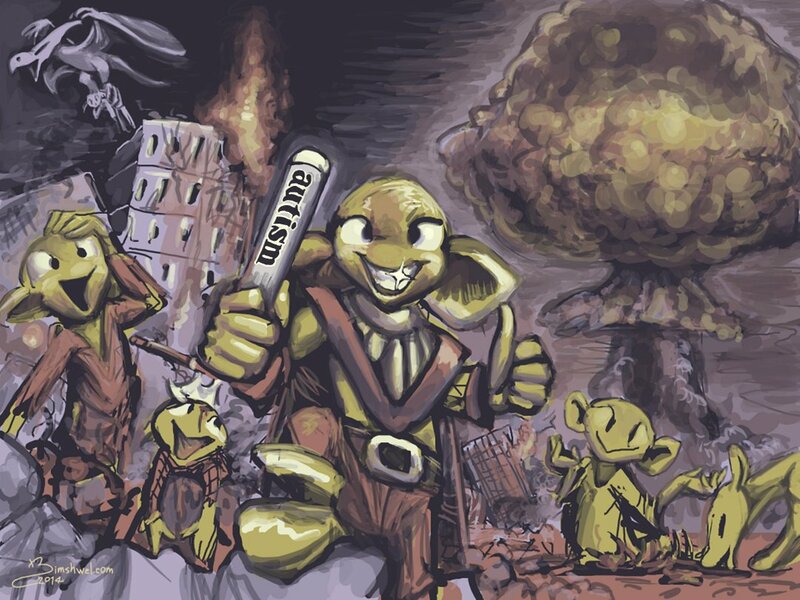 It would be more noteworthy for elpse to thinkly proclaim “does not make me mad!” But elpse is becoming mad here, so no such negative negativity will be exhibited. I also want to have elpse say “oh my squash” where once was said “oh my gourd,” since I imagined “oh my gourd” is too overused as a joke phrase, and squash additionally serves to hint at elpse’s affinity for pumpkins, but that appears to be an equally common joke phrase. Oh my scrod is less so. Of course scrod has no sway over elpse’s actions so this may be due for yet another alteration before I produce the printed edition. I will not keep you posted. pictures in squares | How to lose a guy in (2) days | ! 23 queries. 0.314 seconds. Oh, look at me brag at how fast the page was generated! Aren't you all so proud of me!